1 of 3 Heat oven to 350 degrees . Place squash, cornmeal, milk and soy sauce in a large bowl and stir well. Let mixture stand for 5 minutes to allow cornmeal to soak up some of the liquid. Stir in turkey, egg and garlic. Mix well. 2 of 3 Coat an 8 x 41/2 x 3-inch loaf pan with nonstick cooking spray. Add turkey mixture to pan, smoothing surface. Top with ketchup or barbecue sauce. 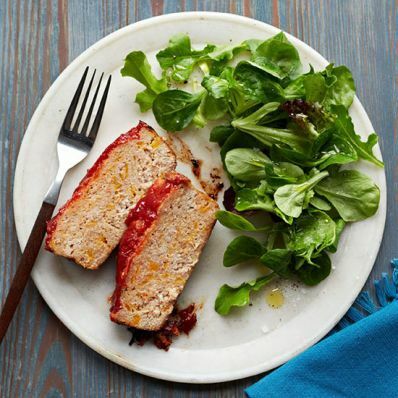 3 of 3 Bake at 350 degrees for 45 to 50 minutes, until meatloaf registers 165 degrees on an instant-read thermometer. Cover with foil and let rest 5 minutes before slicing.